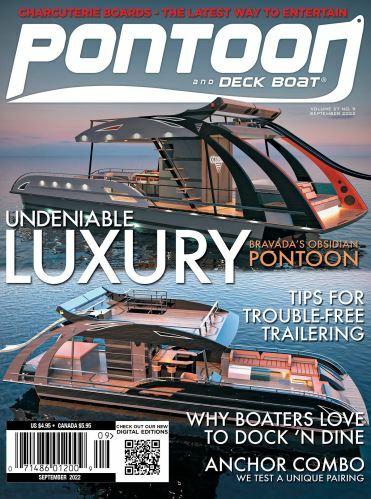 You can always count on Bennington to deliver a classy and elegant-looking pontoon and its latest offering didn’t disappoint. Of course, being able to perform well is another trademark from this manufacturer that we’ve come to appreciate. Clearly the signature feature on this particular model (that is loaded with plenty of key amenities) is the Swingback lounger in the stern. It easily transforms from a traditional rear bench seat to an extremely wide rear-facing lounger with a stereo remote and one of many USB ports we found throughout the boat. The perimeter includes an optional stainless steel rail for added safety since it extends past the stern gate and below the large pad is a pop-up changing room which, based on two factors, is a lot more practical that other enclosures we’ve tested. For starters it stands over six feet tall when open and the other quality we like is you can snap the curtain to the bottom so it stays in place. Also in the stern is a four-step boarding ladder with wide handholds at the top for easier boarding. To get the most out of the big color-matched Yamaha outboard on the back, the well-braced sport arch with Bimini includes a pylon on top that will get plenty of use with this setup. The dual helm stands connect with a walkthrough windshield that complements the sporty arch. Both helm chairs slide, swivel and recline with flip-up bolsters and for the first mate there is an electric faucet and sink, plus 12-volt and USB ports. Directly across for the captain are two automotive-style digital Yamaha multi-function gauges with a Simrad GPS on the right and the Kicker main stereo control on the left with rocker switches on both sides of the steering wheel. In the bow are two chaise lounges with a trash receptacle built into the portside and we found another USB port when we folded down one of the armrests, which you can never have enough of (arm rests or USB ports). The furniture is mostly white with a splash of color and textured vinyl with diamond stitching to complete the look. Also worth noting, the vinyl woven flooring and huge in-floor ski locker are a great added touch. The Elliptical Sport Package (ESP) includes two 25-inch diameter outer pontoons with performance foils, a patented 32-inch elliptical center pontoon with lifting strakes and an underdeck wave shield. Up top there is over 15 feet of usable deck space from inside the front gate to the stern bench with extra room being allowed for more space in the bow. In the stern the rail height drops to 20 inches tall, but for the majority of the pontoon the rail height stands at nearly 27 inches tall. Although painted to match, the Yamaha 350hp outboard did more than just look pretty, it helped this pontoon go from zero-to-20 mph in under four seconds while nearly reaching the 50 mile per hour mark at full throttle. She turns incredibly sharp and with that elliptical center pontoon beautifully banks like a V-hull while doing it. You get the complete package with this Q25 that not only delivers performance, but in comfort and quality as well. Bennington provides that quality and value, which is something this manufacturer has been known for in this industry for decades. Why we love this boat…The Swingback rear lounger really is quite impressive, but this pontoon has so much more to offer in terms of features and amenities than just that. Just being picky…A lot of people prefer a little extra space on the bow, but our test crew felt there is a little too much room and that space could be better used inside the boat. Stainless steel Corvina steering wheel, restyled V2 Pure Comfort reclining Captain’s chair, two portable cupholders w/espresso teak trim, two wide berth chaise lounges w/fold-down armrest/cupholder, interior light dimmer (excluding console lights), self-draining bench seat cooler, stainless steel/woodgrain accents, stainless cupholders, waste container, swingback stern lounger, Duraframe seat bases, RGB lighted Kicker speakers, Simtex vinyl upholstery, privacy enclosure, Q bow storage doors, stereo remote, Pillow Top Q upholstery w/diamond stitching, Seagrass flooring, swingback privacy, underdeck spray reflectors, Surlast mooring cover, full-length extruded anodized skirting, custom Bennington stainless steel cleats, dimensional chrome logos/badge, streamline rail system, side-mount pre-rigging system, swingback lighted stern speaker/grill system, extruded splash guards, extended aft deck w/wide tread telescoping ladder/stainless steel boarding handles, quick release 10-foot Bimini w/Surlast boot, custom Sterling Gauge Pkg. (including compass heading), one-piece fiberglass body integrated w/starboard bow chaise lounge, console footrest, fiberglass door, illuminated rocker switches w/speaker system, Striker 4 Fish Graph, and tilt steering. Yamaha Command Link w/DEC side mount pre-rig, hydraulic assist steering, Simrad GPS G05, RGB side illumination, Firecracker Shatter, smoked windscreen, Glacier white Simtex vinyl upholstery, stainless steel Keeper Rail R/Q, pressurized water system, bamboo slate full flooring, in-floor storage, dual batter w/switch, Elliptical Sport Pkg., stainless steel sink upgrade, center tube fuel tank, cladded sport arch w/Kicker speakers, RGB underwater illumination, RGB cupholder lighting, two reclining helm chairs w/bolster, and Yamaha Saltwater Anode Pkg.